Rent a Bounce House for These Events! Bounce houses add excitement to any gathering. If you’re planning a party and seeking a way to entertain children, a bounce house is the perfect option. Consider renting a bounce house for these events! Your child can have the birthday party of their dreams with a bounce house. Consider a bounce house as a way for children to get out their energy. Bounce houses promote an active lifestyle in children and are also safe to use. When picking a bounce house for your child’s birthday party, you can select a design that matches the party’s theme, or pick a bounce house that goes along with your child’s interests. At Pink Elephant Party and Tent Rentals, we have castle bounce houses, monster truck bounce houses, sports-themed bounce houses, and so on. Another event to rent a bounce house for is a family reunion. Family reunions have guests of all ages. To entertain the children, consider a bounce house. Adults can socialize, while the children play in the bounce house. Hosting a barbecue or company picnic? If so, a bounce house is a perfect rental. A bounce house can take your BBQ to the next level, entertaining guests and creating memories and laughter. Bounce houses are right at home at fundraisers and community events. These large inflatables will attract attention from passersby, which also attracts attention to your community event or your fundraiser. A bounce house can double as entertainment and marketing when used at public gatherings. If you’re interested in renting a bounce house, Pink Elephant Party & Tent Rentals is the best option. We offer a wide variety of inflatable outdoor entertainment, perfect for your next event. 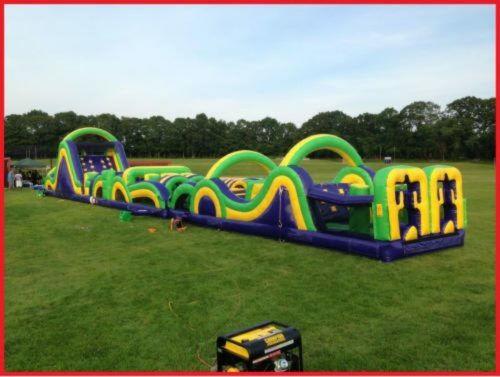 For additional details about our bounce houses, feel free to visit our website or give us a call at 631-357-3561 today!